1. Rinse and dry scallops. Set to side. Whisk together all curry emulsion ingredients using 1/2 can of coconut milk. This can be made ahead of time and stored in the fridge. 2. Preheat oven to 425°. 3. Toss the cauliflower slices with a conservative drizzle of olive oil, in the oven for 20 minutes. 4. Cook couscous (the same as you would cook rice) with chicken broth. 5. While couscous and cauliflower are cooking, heat 2 tsp. of olive oil over medium heat. Add minced garlic and cook 1 minute. Add spinach, and stir through olive oil until just wilted. Remove from heat. 6. Toss couscous with spinach in its olive oil. Add cauliflower and slivered almonds. 7. Heat butter in skillet on medium-high heat. Salt and pepper the dry scallops. Add to pan and cook approximately 90 seconds on each side until golden crust achieved on both sides. 8. 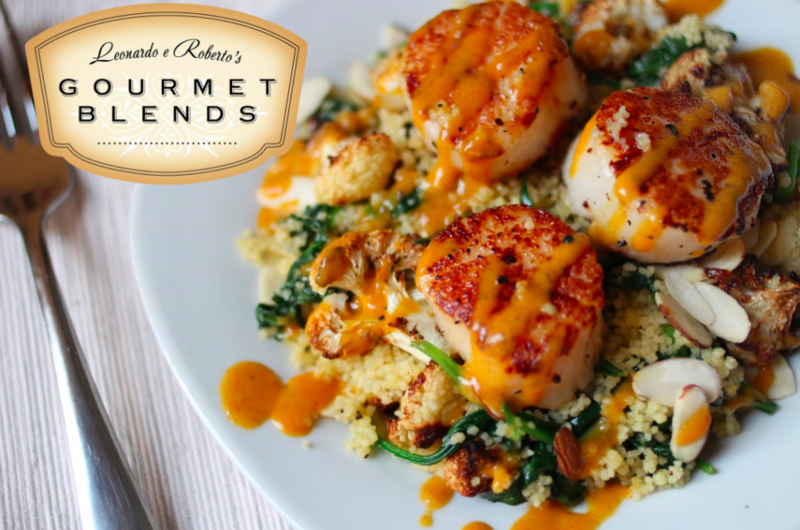 Top couscous with scallops and drizzle with curry emulsion and enjoy! This entry was posted in Balsamic Vinegar, D'Anjou Pear White Balsamic Vinegar, Recipes by Cirita Robinson.